Chiang Mai food keeps drawing us back to the largest city in northern Thailand. On a recent trip, we spent two months delving into northern Thai cuisine and the flavors we fell in love on our initial one month, stay two years ago. The food in northern Thailand has its own distinct identity. It draws from the mountains and cool climate as well as the influence of the northern neighboring countries like Burma, Laos, and China. The food in Chiang Mai goes beyond northern Thai food. You will also find food from the Isaan region, the northeast part of Thailand, which shares similarities to Laos and Cambodian cuisine. And in addition, there are signature Chiang Mai foods at some of the best places to eat in Chiang Mai, that you simply cannot miss. 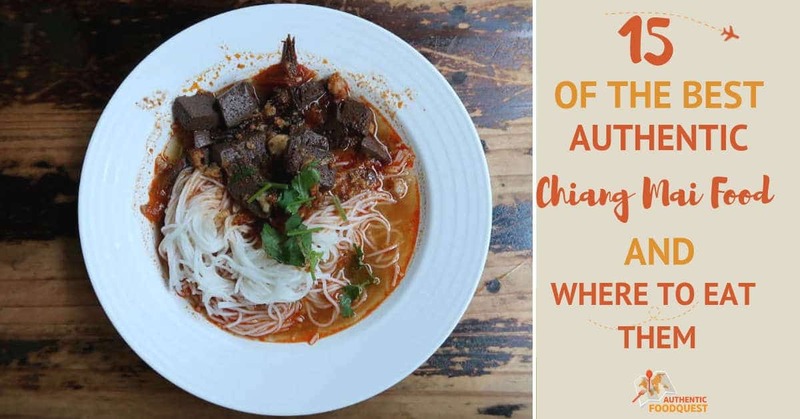 On your travels to Chiang Mai, use this comprehensive authentic food guide to savor the region’s rich culinary tradition with this list of 15 authentic Chiang Mai foods. Unlike the food you’ll find in Bangkok or the Thai curries you’ll find at your local Thai restaurants, Chiang Mai food or the food you’ll find in northern Thailand is one of the less celebrated regional cuisines of Thailand. Chiang Mai was founded in 1296 as the capital of the ancient Lanna Kingdom. You will often see Chiang Mai food sometimes referred to as Lanna food. Due to the cooler, mountainous climate, the food is fattier as people need to stay warm. Fish from the local rivers used to dominate northern Thai cuisine, but over the years that has been replaced with pork and chicken. Locals eat a lot of roots and wild vegetables including mushrooms young bamboo shoots, cabbage, raw eggplants, winged beans and more. Unlike in Bangkok, where coconut milk is a staple ingredient in many of the curry dishes, seasonings used in the food in Chiang Mai are not as sweet or spicy. And soups and curries have a clear broth. Chiang Mai food is always accompanied by sticky rice, which locals refer to as khao neow. 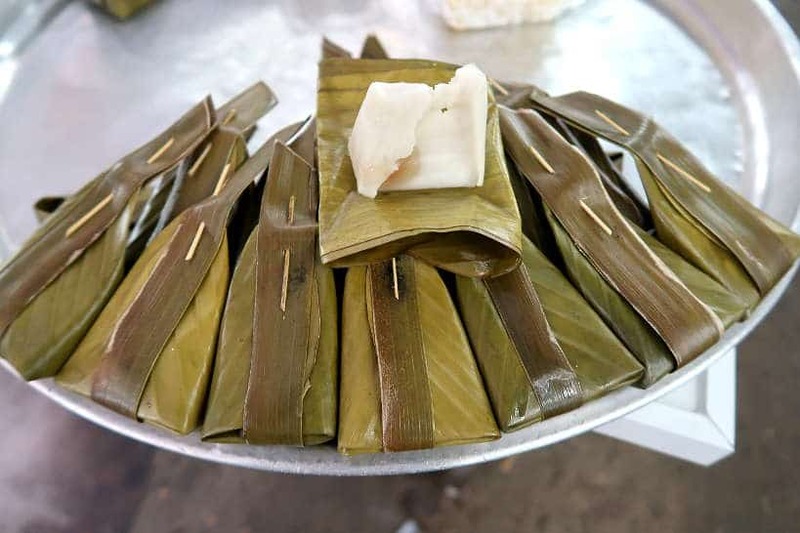 This is one of the commonalities with Laos food, where sticky rice is the national staple. 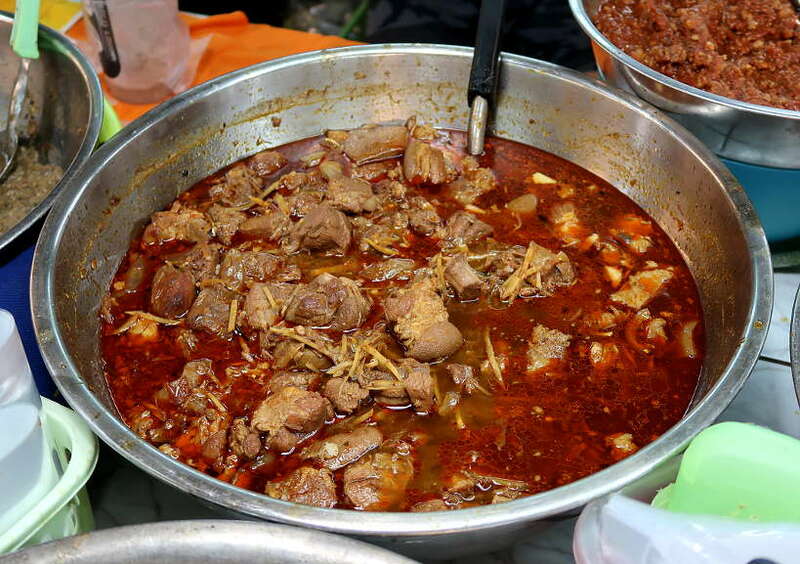 One northern curry dish we always seek out in Chiang Mai is gaeng hang lay, a slow cooked curry of pork (usually belly and shoulder) with ginger, tamarind and Indian spices. This dish has its roots in Burma and is close to the massaman curry, you’d find in Southern Thailand, without the curry milk. We love the rich flavors of this curry. The ginger (galangal) adds a delicious kick and the slight sourness from the tamarind is divine. We’ve had this dish at Chiang Mai restaurants and from vendors at the local markets. One of the biggest differences we’ve noticed is in the quality of the pork. At times, it can be fatty, while other times, lean and tender. 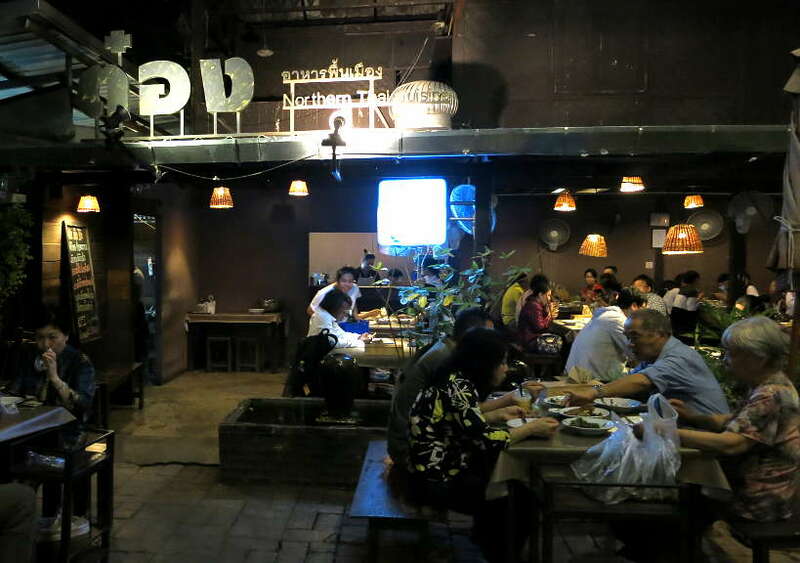 Following are two of the best places to eat in Chiang Mai for gaeng hang lay. This Lanna style restaurant in the South Gate area in the Old City of Chiang Mai specializes in northern Thai food. We discovered this restaurant on a Chiang Mai northern food tour and went back again because we loved it so much. 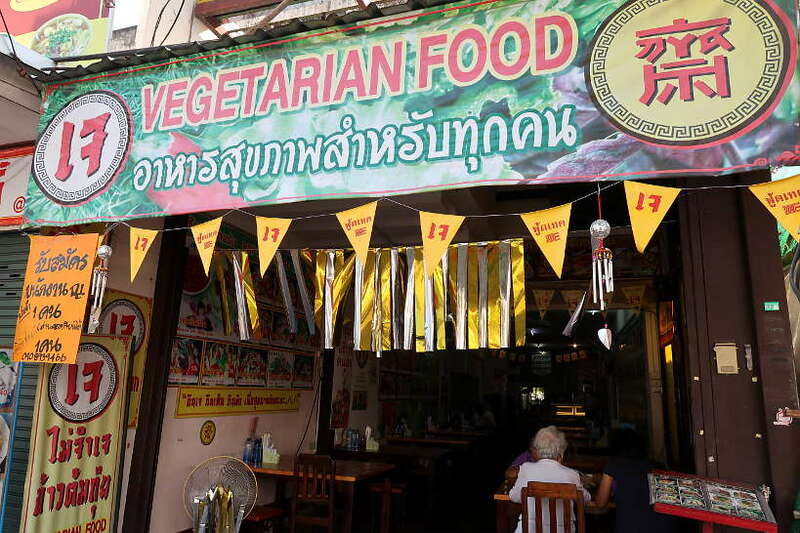 This unassuming restaurant has a wonderful backyard, a little oasis in the city where you can linger on Chiang Mai food. Order the aromatic pork curry and enjoy the tender stewed pork cooked in a variety of spices and herbs including, palm sugar, tamarind, turmeric, ginger, garlic and more. Pro Tips: Have your Gaeng Hang Lay Moo the northern Thai way, with sticky rice. Their Laarb, another northern Thai specialty, is also delicious. 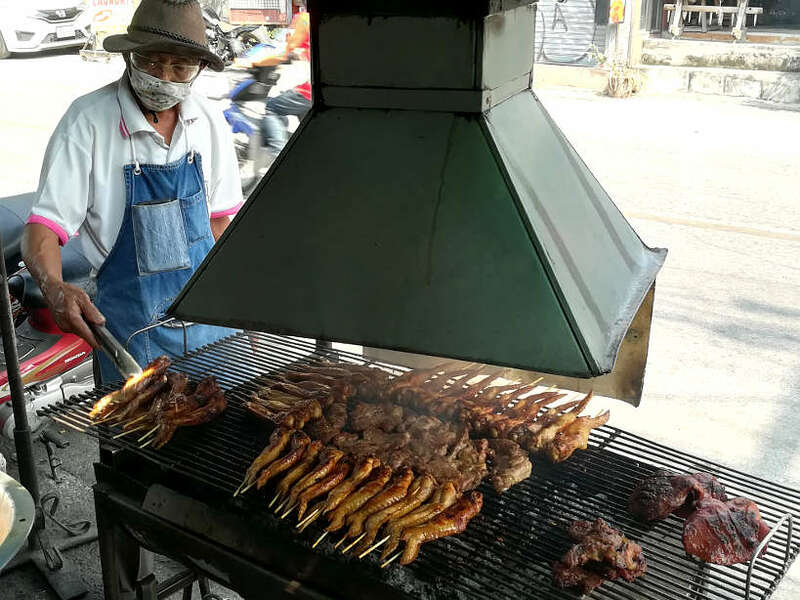 To get the ins and outs of Chiang Mai food and taste Gaeng Hang Lay Moo as well as other northern Thai food, book a Chiang Mai Northern Food Tour by Truck. One of our favorite local markets in Chiang Mai is Ton Payom, a local market behind Chiang Mai University. We like the focus on Chiang Mai food and northern specialties like sai oua sausages, nam prik dipping sauces and cooked dishes including gaeng hang lay moo. At the entrance, near the fruit section, is where you’ll find the friendly vendor who makes in our opinion, the best northern pork and ginger curry. You’ll see her next to the huge bowl slow cooking and often times, locals stopping by to order their pork curry to go. Address: Ton Payom Market is located behind Chiang Mai University, at the intersection of Suthep Road and Chiang Mai Outer Ring Road, Chiang Mai. Pro Tips: This lady is very popular, so get there before 2:00 pm, as she tends to run out. 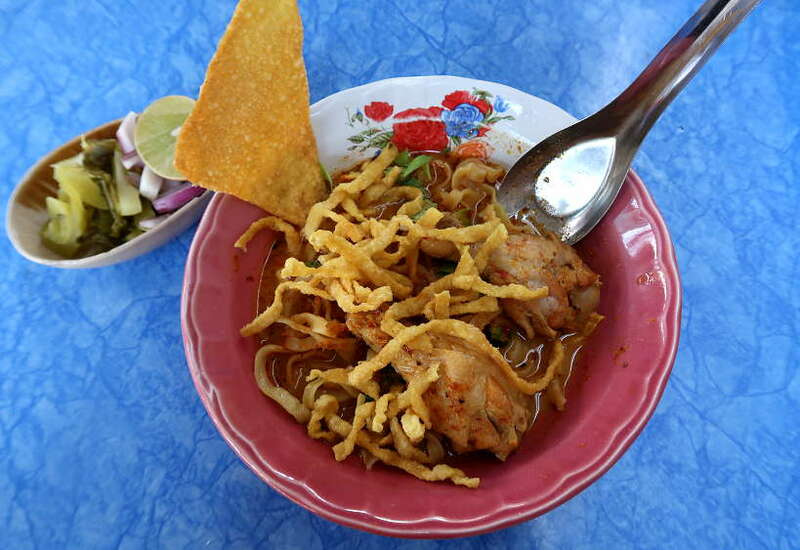 Khao Soi (also spelled Khao Soy) is the most famous Chiang Mai food. It is a northern Thai noodle soup made with a rich and spicy coconut curry and served with chicken or beef and two types of yellow noodles. From the South of China, the dish made its way to Thailand with Chinese Yunnanese Muslims traders on their way to Myanmar. That’s why it’s found primarily in the north of Thailand. The main ingredients are freshly made the red curry paste, turmeric powder, and curry powder. The coconut curry broth has both boiled and deep fried egg noodles and chicken or beef. Khao Soi in Chiang Mai is accompanied by a fresh lime wedge, shallots, pickled cabbage, and roasted chilies. We have fallen in love with the khao soi, this glorious Chiang Mai food with a fragrant broth that is rich but not oily and with the perfect balance between spicy, sour and sweet. With meat falling off the traditional chicken leg, this is a meal perfected in heaven. After spending three months in Chiang Mai, our article, fall in love with the best authentic khao soi in Chiang Mai, follows our quest to find the best authentic khao soi. After trying khao soi at many of the best places in Chiang Mai, our favorite khao soi continues to be from a street food vendor near the main Huay Kaew road. Pro Tips: This stall is very popular with the locals. Go at about noon for the best experience. You can also get a larger bowl of khao soi for 35 Thai Baht. Sai oua, another famous Chiang Mai food are fragrant sausages found in northern Thailand. Also spelled sai ua, these sausages are said to have their roots in Burma or Laos. This is another of our favorite Chiang Mai foods. These are fragrant sausages infused with a wonderful blend of Thai spices and herbs like lemongrass, kaffir lime leaves, and galangal and then grilled to perfection. Traditionally, northern Thai sausages were prepared in this manner as a way of preserving food for a couple of days. To dive deeper into this local Chiang Mai food, we partnered with A Chef’s Tour to learn how make sai oua sausages from the legendary auntie Rod, also known as the queen of sai oua. 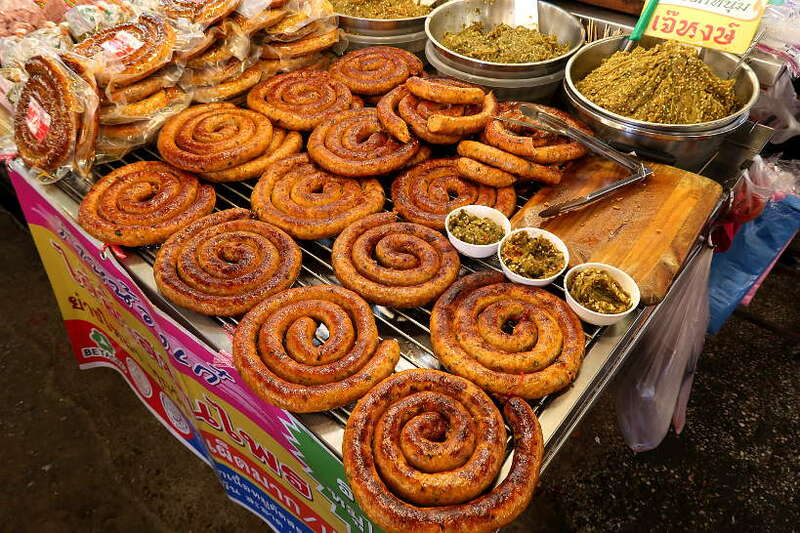 In Chiang Mai, you’ll find sai oua sausages sold at the local markets. As with each local cook, the taste and flavors vary slightly. Some are spicier than others, some a little fatty, while others have more lemongrass and herbs. One of our favorite vendors is at Ton Payom market. You can sample sai oua from the different vendors buy them hot off the grill. Ton Payom Market is one of the best places in Chiang Mai to taste sai oua. 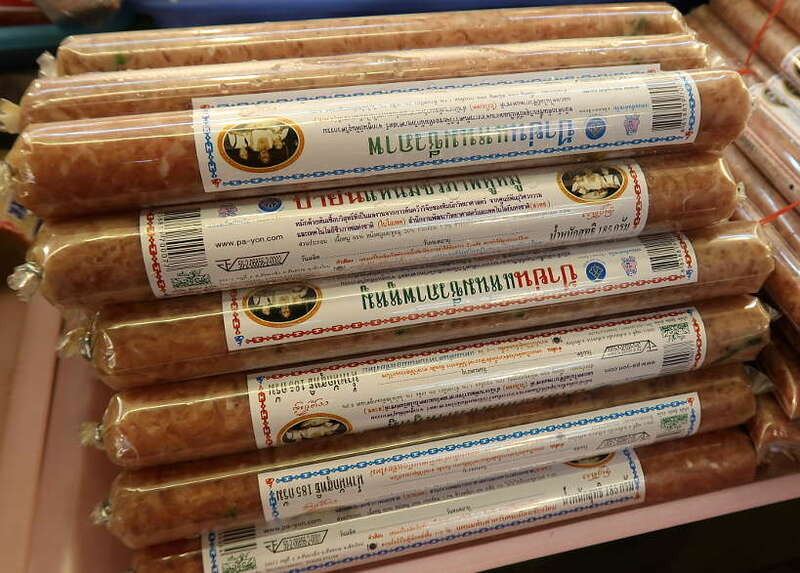 There are many vendors where you can sample the Northern Thai sausage. One of our favorite vendors is located in the middle of the stalls. 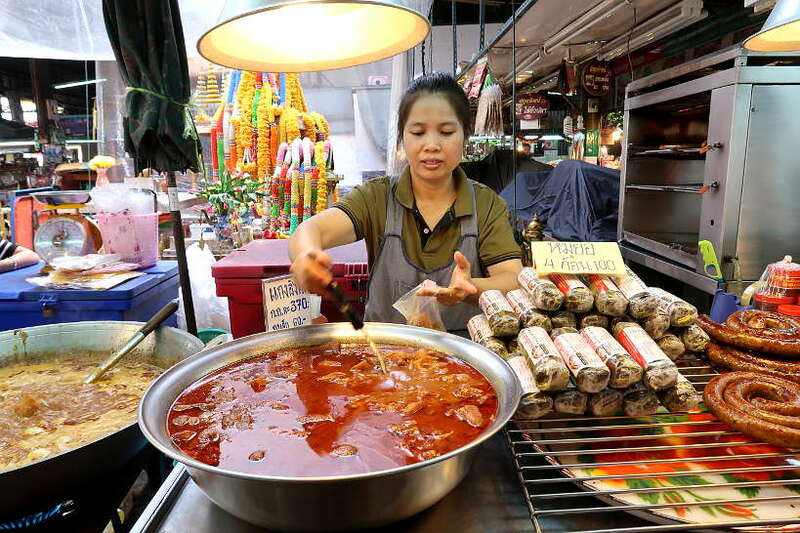 You will identify her with the large selection of Thai fermented pork sausage called Naem, that is around her stall. We like the sai oua she sells as it is well spiced and on the lean side. She also has a milder version, for those who don’t like spice. At the market, you can also taste nam prik and kap moo, other northern Thailand or Chiang Mai foods. 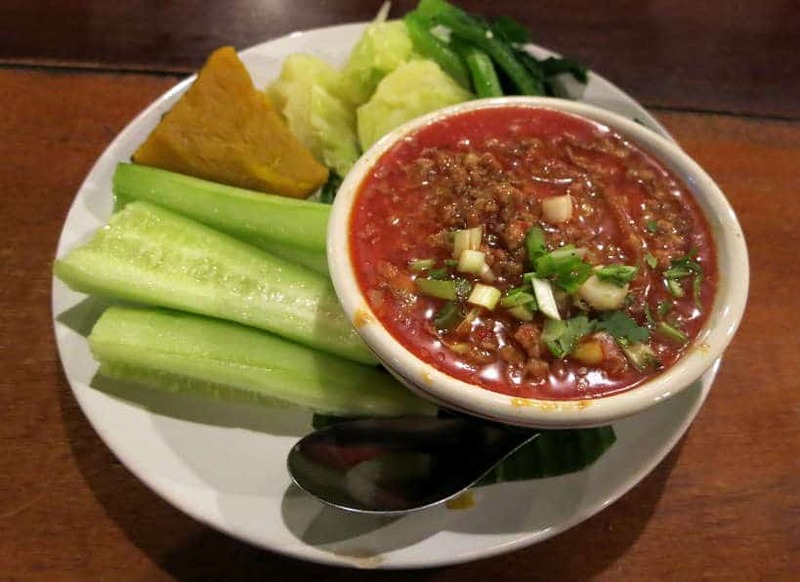 Chili dips in northern Thailand are very popular and are a Chiang Mai food found on every northern Thai dinner table. Nam Prik Ong, is a favorite Chiang Mai food. It is red in color and made with stir-fried chilies, garlic, shallots, shrimp paste, and ground pork mixed with cherry tomatoes and chopped fresh coriander. It has a thick texture, similar to a Bolognese or ragu sauce. This pork tomato chili dip is commonly served with vegetables like cabbage, cauliflower, eggplant, long beans, and okra. It is mild and very flavorful with a nice garlic and fresh herbs taste. We love this dip and it is the kind of northern Thai starter that will please any palate. 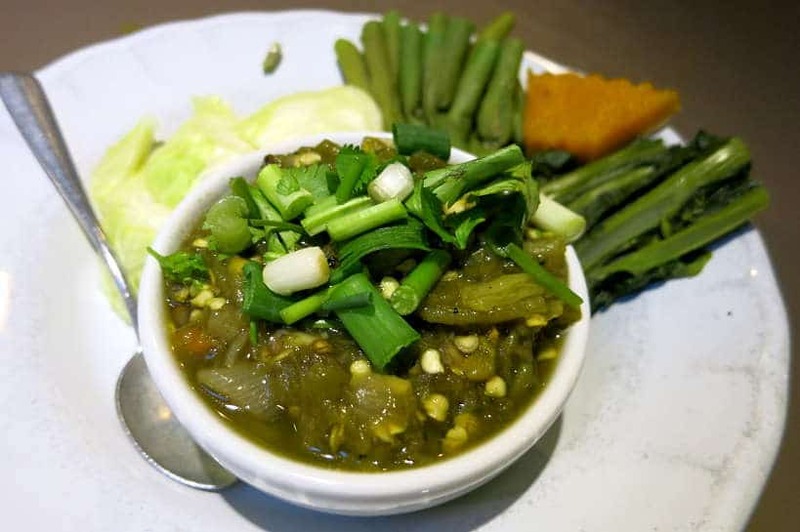 Nam prik noom, or Thai Green Chili Dip, is another well-known dip that is enjoyed across Thailand. Its roots are also in northern Thailand, where it remains popular. Green in color, this dip is made with roasted green chilies, shallots, and garlic. We would describe it as hot and sour. Accompanying this dip are fried pork cracklings, also known as kap moo, northern sausages, boiled eggs or cooked vegetables. Sticky rice is also served with this dish to make it a meal. Unlike the red chili dip, this one has an enjoyable smokey and garlicky taste. Tong Tem Toh is a large and airy restaurant in the core of Niman neighborhood. It is very popular with Chinese tourists. Be prepared to wait outside the restaurant during the peak hours of lunch and dinner. What’s great about Tong Tem Toh is their extensive offering of Northern Thai food including northern style soups and barbecue. Order one of their chili dips with a side of kap moo and sticky rice. Pro Tips: Arrive early for dinner or lunch to avoid the long lines. In the north of Thailand, locals believe that khanun (jackfruit) is a lucky name in Thai. As such, jackfruit is cooked at important ceremonies like weddings and New Year celebrations to ensure prosperity and success. When the bride and groom eat jackfruit, Thais believe they will always support each other. Furthermore, when jackfruit is eaten at New Year’s, they believe they will have good luck all year. While in the north of Thailand, you cannot miss this auspicious Chiang Mai food. Jackfruit is used in curries, salads, and desserts. The unripe jackfruit is boiled until tender, pounded with seasonings, and briefly cooked. To make the jackfruit salad, young jackfruit is preferred for its subtle flavors. It is mixed with minced pork, ginger, garlic, shallots, lemongrass, kaffir lime leaves, chiles, and more. We enjoyed this salad several times and each time noticed a slightly different taste based on the ingredients used. The texture is firm and meaty, making it quite filling. This is a refreshing salad, full of flavor with a spicy, salty, sweet, sour, and nutty taste. Huen Muan Jai located on the northwest side of the Old City is a northern Thai restaurant set in a traditional Lanna style house. On their menu is an extensive offering of northern Thai specialties. 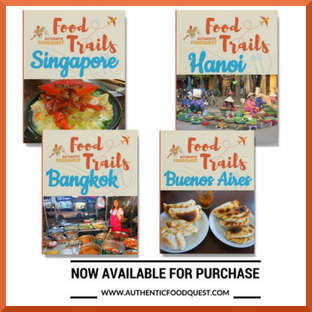 This is an ideal place to sample many dishes highlighted in this article including, nam prik, sai oua, khao soi, or gaeng hang lay moo. Pro Tips: Order the northern appetizer sampler to get the taste of Chiang Mai food all on one plate. 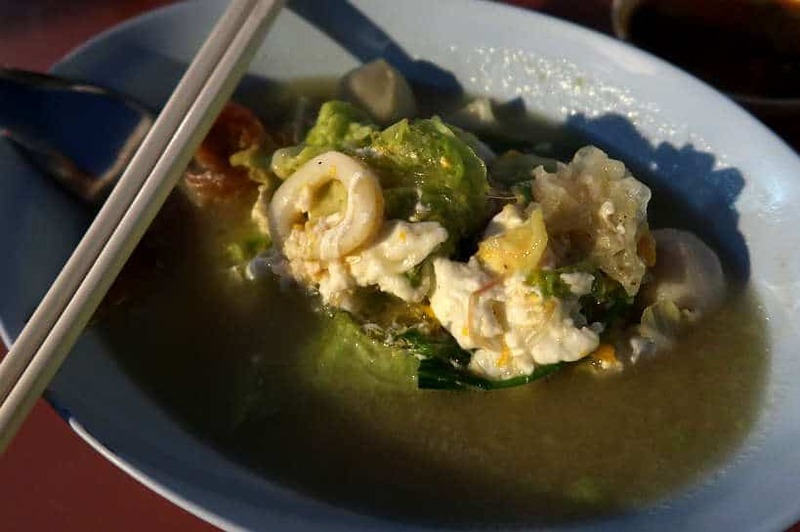 While Kao Soi gets all the attention as the most famous noodle dish in northern Thailand, kanom jeen nam ngiaw is another of the region’s noodle superstars. This dish is most associated with Chiang Rai and has Burmese and Yunanese influence. Khanom Jeen Nam Ngiaw (also spelled Khanom Jeen Nam Ngiao) is a noodle soup which starts out with vermicelli-style rice noodles in a broth of pork, spice paste, herbs, and tomatoes. 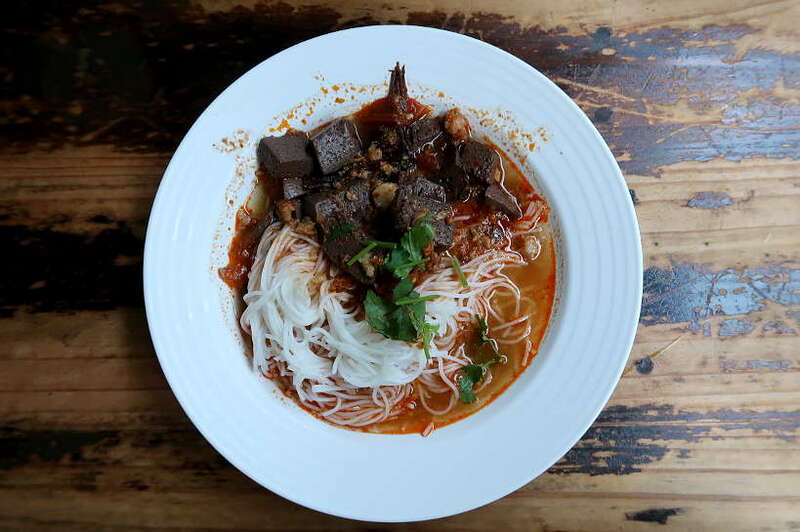 Khanon Jeen means “fresh rice noodles” and nam ngiaw is a spicy tomato infused broth. Pork is typically the main ingredient with cubes of dried chicken blood. Chopped tomatoes, chilies and garlic give this dish flavor and spice. The broth can range in taste depending on the cook. It can range from spicy to meaty and savory. Served alongside the noodle dish are pickled cabbage, bean sprouts, and a fresh lime wedge to liven up the meal. Claire particularly enjoyed the fragrant and spicy textures of this dish. There are several restaurants serving this Northern Thai Soup, Khanom Jeen Nam Ngiaw. One of our best Kanom Jean Nam Ngiao was at Khao Soy Mae Sai. This restaurant is well known for their Khao Soi, however, we have our own favorite place for Khao Soi. This local eatery focuses on a few soups typical from northern Thailand and we particularly liked the flavors in this noodle and pork soup. 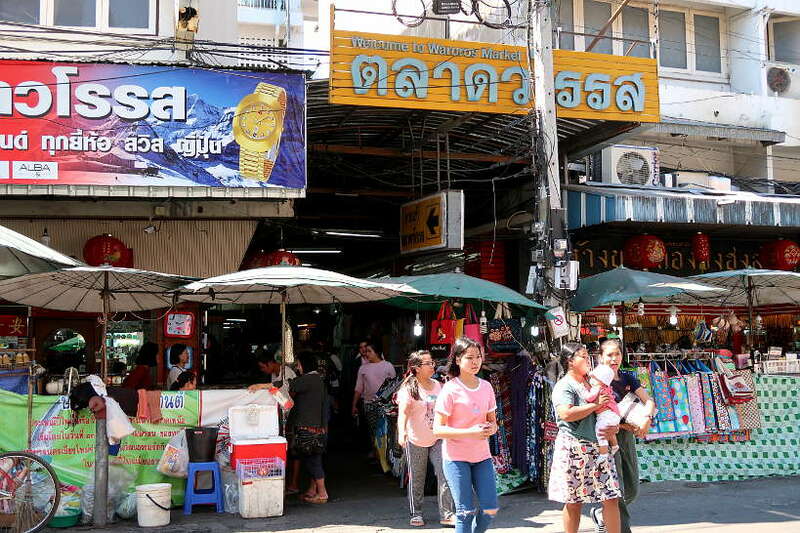 Pro Tips: Khao Soy Mae Sai has become really popular with tourists, making it crowded and a bit annoying to eat there during peak season. The best is to go early before lunch hours to avoid the hoards of tourists. One of the best street food vendors to taste Kanom Jean Nam Ngiao is the Noodle Soup Lady at Warorot Market. 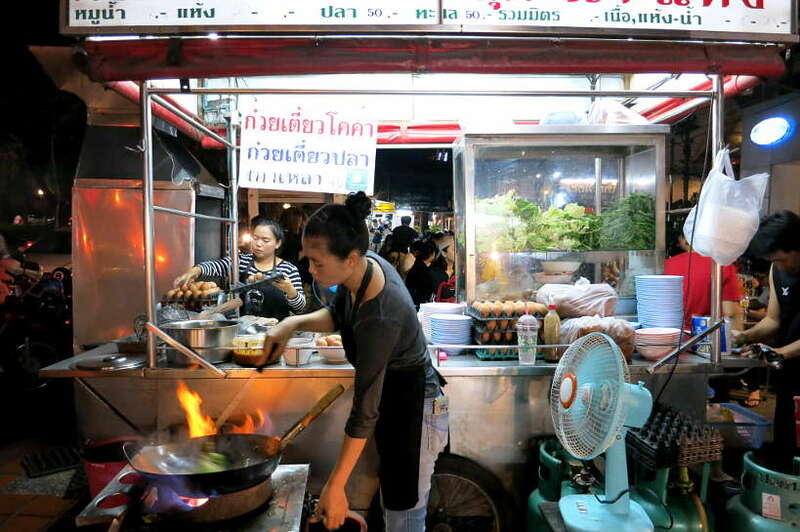 We discovered this celebrated noodle vendor while on a Chiang Mai food tour. For more about Chiang Mai food and to sample northern Thai food, book a Chiang Mai Northern Food Tour by Truck. In the forested and mountainous area of northern Thailand, mushrooms feature prominently in the local cuisine. They are important to the region and there is even a Mushroom Research Center, just north of the city of Chiang Mai. We were struck by the diversity of mushrooms we saw every time we went shopping at the local Chiang Mai markets. Likewise, the prepared meals section at the local markets also had several intriguing dishes featuring mushrooms or het, in Thai. During our recent two month stay in Chiang Mai, we saw more diverse mushrooms than we had seen on our previous Chiang Mai trip. To taste Chiang Mai food made with several of these local mushrooms, locals told us to visit a vegetarian restaurant close to Chiang Mai University. 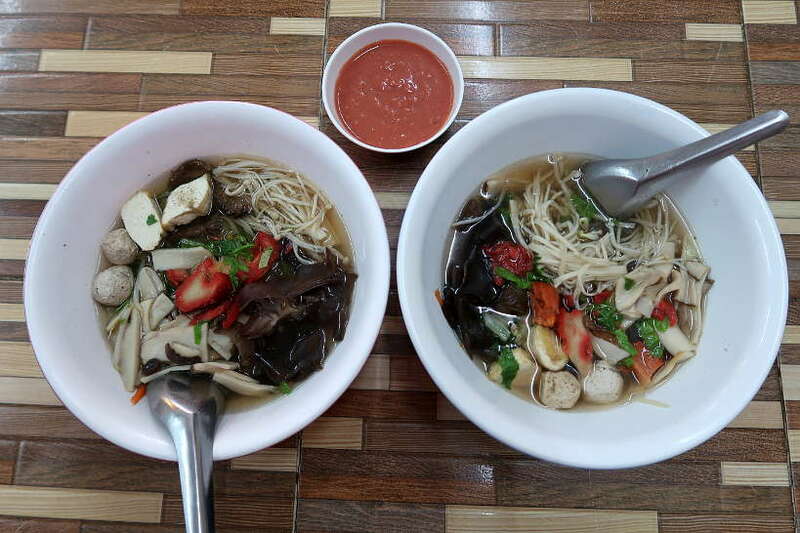 We enjoyed two incredibly delicious mushroom soups, filled with vegetables, meaty mushrooms and faux meats or tofu in clear broths. With flavors and ingredients we have never tasted before, we recommend savoring northern Thai mushrooms on your Chiang Mai food travels. Walking through the local markets in Chiang Mai, you’ll notice small portions of this Chiang Mai food wrapped up in banana leaves. The shapes are different. Some are triangular, others are long rounded rods, and some just short and stumpy. Either way, they are all fascinating as they hold delicious treasures within. The first few times we saw the banana wrapped delights, we tried to ask the vendor what was inside, but due to language limitations, we were not able to communicate. Curious, we decided to buy a few different ones and discover the hidden treasures for ourselves. Once we got home and unwrapped them, we were surprised to find both sweet and savory delights. The sweet ones all contained sticky rice with coconut milk added. The ones we tried also had layers of custard, banana and black beans. Our favorite was the sticky rice with custard, also called Khao niao sangkhaya. Prepared with glutinous rice, egg custard, and coconut milk, it’s worth buying several of these banana wrapped treats. The savory ones, known as naem (nem) are sour pork sausages. You will find these sausages either wrapped in banana leaves or in wrapped in plastic. These sausages are made with ground pork skin, sticky rice, garlic, chilies, spices and then fermented for a few days. The flavor is strong and one we were not fans of. The flavor is tangy and a great treat for those who love sour flavors. 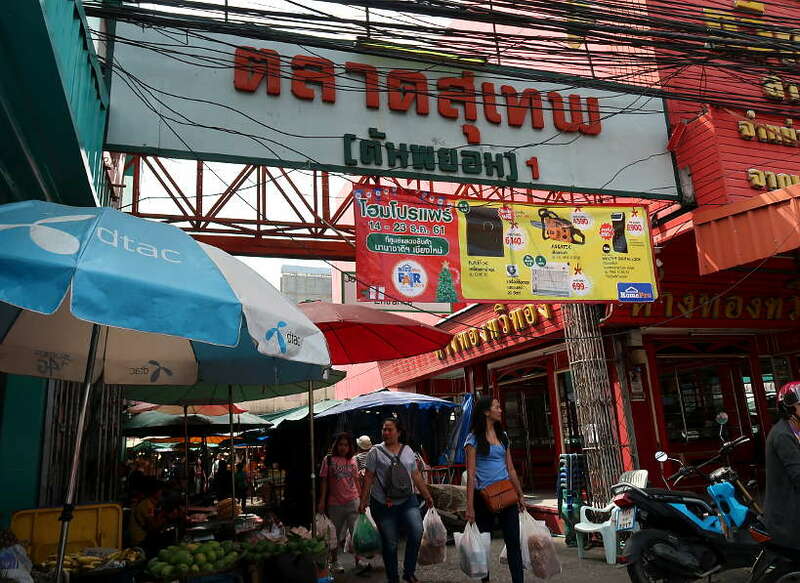 Warorot market is the largest market in Chiang Mai, in the Chinatown area. There is a wonderful food scene with different vendors in the morning and at night. During the day, inside the main building, you will find a section for sweet treats as well as a section for savory and sai oua sausage. Let yourself get tempted as you peruse the various banana wrapped treats. Prices: 10 to 20 Thai Baht – Approx. $0.30 to 0.60 USD per savory and sweet treats. Northeastern Thailand or the area that borders both Cambodia and Laos is known as the Isaan region (also spelled Isan or Issan). The food from this region is simple and spicy with some iconic dishes enjoyed throughout Thailand. Som Tam or papaya salad comes from this region. Meat salads like larb and grilled meats and soups with preserved fish are common. In Chiang Mai, you will find northeastern specialities that are part of the fabric of the Chiang food culture. On your northern Thailand travels, go on a culinary adventure at some of the best restaurants in Chiang Mai for Northeastern or Isaan food. Larb (also spelled Laab, Larp) or spicy minced pork salad is found in northeast Thailand and Laos. 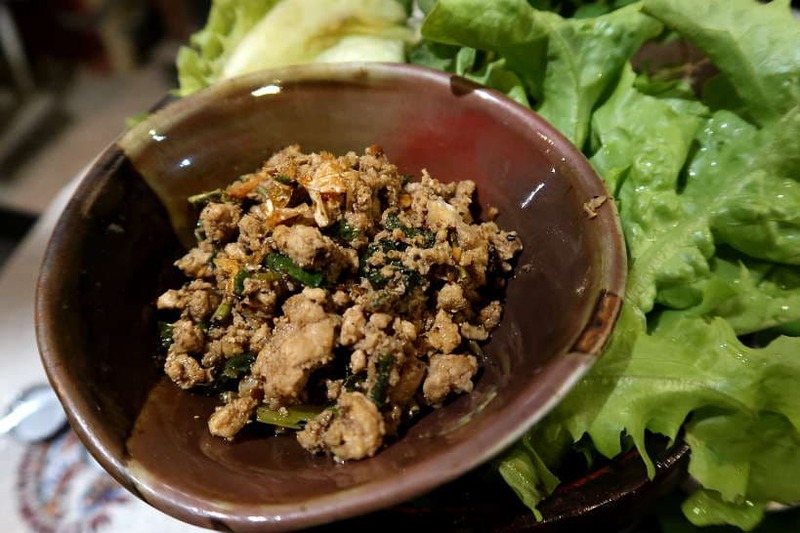 In Laos, Laos Larb is a signature dish and often referred to as the country’s national dish. In Thailand, Larb is commonly eaten in the Northeast part of Thailand and is a main staple dish of Isaan food. The northern Thai or Chiang Mai food version is spicier than the northeastern version. Both versions start with the same protein base of either pork, chicken, beef or duck. The Chiang Mai larb version tends to be a darker mince with a mixture of pork, offals, pork blood cubes, quickly heated in cooking oil and served with a healthy dose of herbs and spices. Whereas the Isaan version tends to include toasted rice, lime juice, fish sauce and fresh chilies. Eaten typically with sticky rice, don’t miss this Chiang Mai food on your northern Thailand travels. Located in the Old City, Hueng Phen restaurant is a great option for northern Thai food. Huen Phen has been serving locals and tourists alike for more than 30 years. They offer an extensive list of northern Thai dishes. One of the bests dishes we had at Huen Phen was the minced pork salad Northern style or larb. Served in a beautiful served small bowl with a large plate of leafy greens, this is a great dish to share with a side of sticky rice. Pro Tips: For a more local atmosphere, skip dinner and go there for lunch instead. You will avoid large groups of tourists that come in the evening. Thai green papaya salad, also known as som tam in Thailand is one of the more common dishes you’ll find throughout the country. 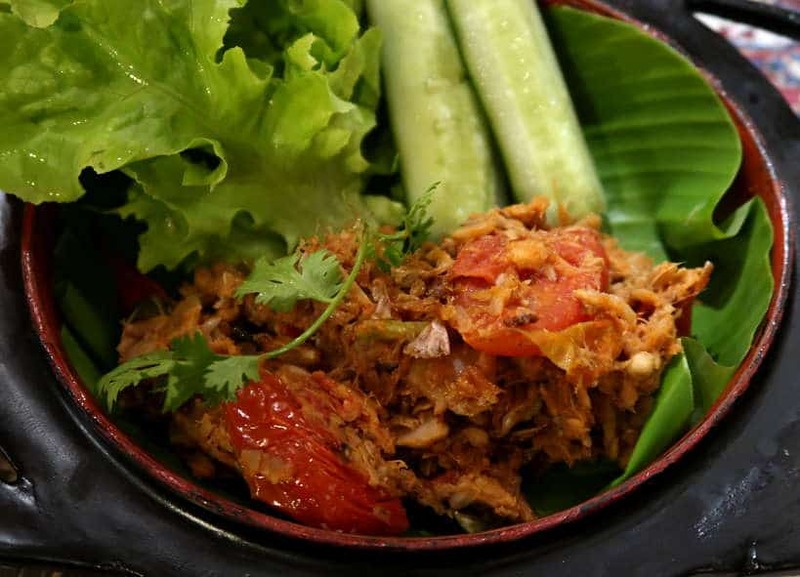 Originally from the Isaan region or northeastern part of Thailand, it is also a popular dish in Laos. The ingredients in this green papaya salad that we learned to make in Chiang Mai cooking class are actually quite simple. The main ingredients call for chilies, tomatoes, green beans, fish sauce, palm sugar and fresh lime juice. To get the most flavor, everything is mixed by hand, using a pestle and mortar. There are many variations to this Chiang Mai food. There is papaya salad with fermented fish and white pork sausage called Tum Mou. You’ll also find Tum Hoi Dong, which is a papaya salad with marinated shellfish. Yum Suo Saknakorn is another popular northeastern style salad with rice vermicelli noodles. If you are pork fan, you will enjoy Tum Kor Moo Yang, which is the spicy salad mixed with grilled pork neck meat. 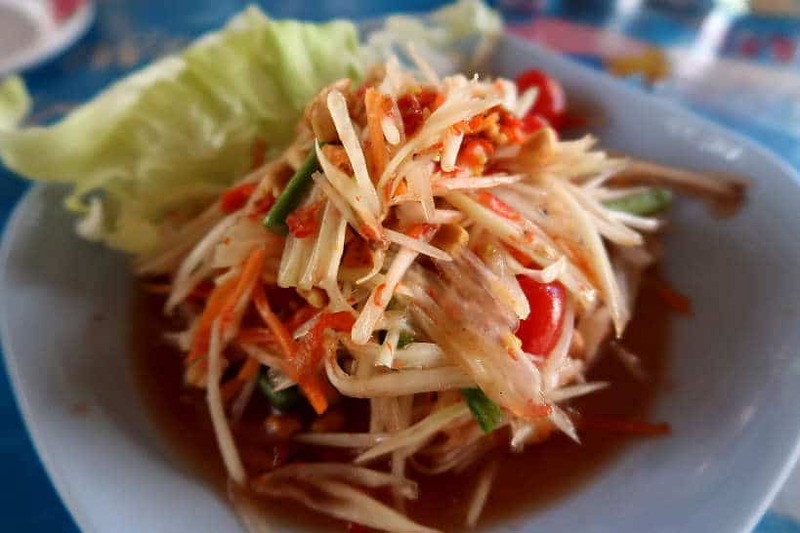 Whichever way you prefer to have this iconic Thai salad, be sure to savor the flavors of this food in Chiang Mai. Better yet, take a cooking class and learn how to make green papaya salad. This local restaurant gets busy with students from the nearby Chiang Mai University. The eatery specializes in serving Thai salads, sour Thai soup also called Tom Yum soup, and chicken skewers. The green papaya salad and all their other salads are made fresh to order. Order your green papaya salad with sticky rice and add a serving of chicken skewers to complete your meal. You will also find a nice selection of Thai salads like cucumber salad, corn salad or green papaya salad with blue crab. Address: Jed Yod-Chang Khian Rd and Jed Yod-Chang Khian Rd Soi 7, Chiang Mai next to Chicken Ryder restaurant. Pro Tips: The salads and soups are served very spicy. Don’t hesitate to ask for little or no spice as this will definitely burn. Kai Yang Nong Krob is grilled chicken in Thai. It is a classic dish that comes from the northeastern Isaan region of Thailand. It is also a very popular street style dish eaten all over the country. One of the joys of traveling through local and authentic food is seeing how different countries approach the same dish. 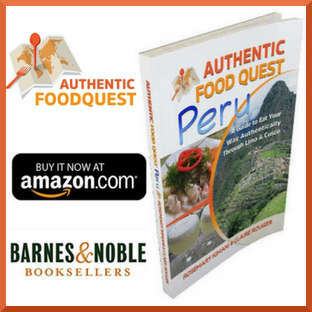 In Peru, for instance, Peruvian rotisserie chicken is called pollo a la brasa and it is so popular that it even has its own national holiday, celebrated on the third Sunday of July. The grilled chicken cooking style in Thailand is unlike pollo a la brasa in Peru. In Thailand, the grilled chicken is made with a whole chicken whose backbone has been removed for quick cooking and crispy skin. Whereas in Peru, the whole chickens are cooked in special ovens which rotate the chickens cooking them uniformly while keeping the juices and flavors intact. The chickens in Thailand are marinated in garlic, lemongrass, Thai soy sauce and fish sauce. Though you will find differences in the recipes used depending on the region and the cook. Grilled chicken is typically eaten with sticky rice and green papaya salad or som tam. The combination of these three dishes makes for a spicy, flavorful and succulent meal. Judging by the lineup of chicken skewers on the barbecue stands on the sidewalk of Toy, you know that grilling is taken seriously here. 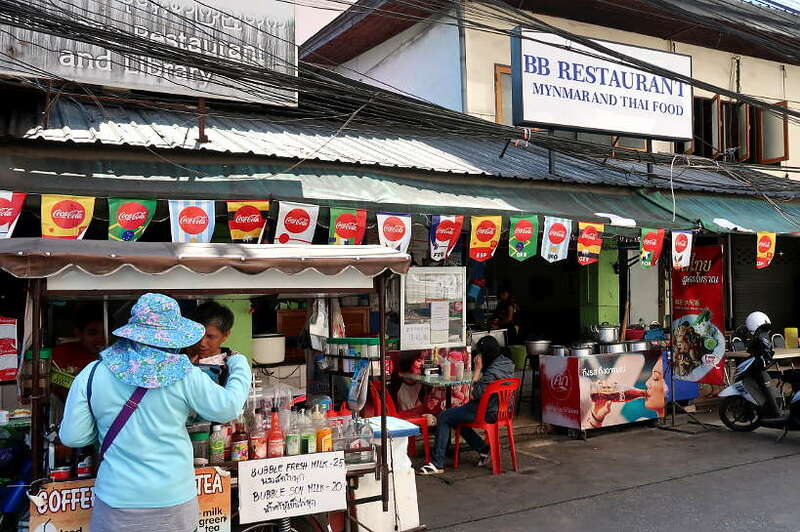 Located East of Wat Loi Kro before the Ping River, Toy is an ideal stop for lunch while sightseeing in and around the Old City. The chicken skewers freshly grilled are brought to the table ready to be eaten. The chicken was well cooked with a hint of lemongrass flavor and slight sweetness and bite to it. Combined with a side of sticky rice and a green papaya salad, it makes for a tasty lunch. We also recommend the grilled pork salad which we found really flavorful with perfectly grilled and tender pork. Address: 53 Kampangdin Rd, Chiang Mai. Pro Tips: Order the spicy grilled pork salad or moo nam tok for another delicious Isaan dishes. Cherng Doi is another restaurant located in Nimman that serves grilled chicken. The restaurant is more on the touristy trail. However, their chicken or Kai Yang Nong Krob, is exceptional and served with a delicious sour-sweet tamarind sauce. Address: 2/8 Suk Kasame Rd, Su Thep, Chiang Ma, Chiang Mai. A trip to Chiang Mai would not be complete without eating some of these iconic foods. These local restaurants and eateries are institutions in Chiang Mai and worthy of exploring while in the city. Chiang Mai food has been influenced by Burmese cuisine and in particular the cuisine of the Shan State. 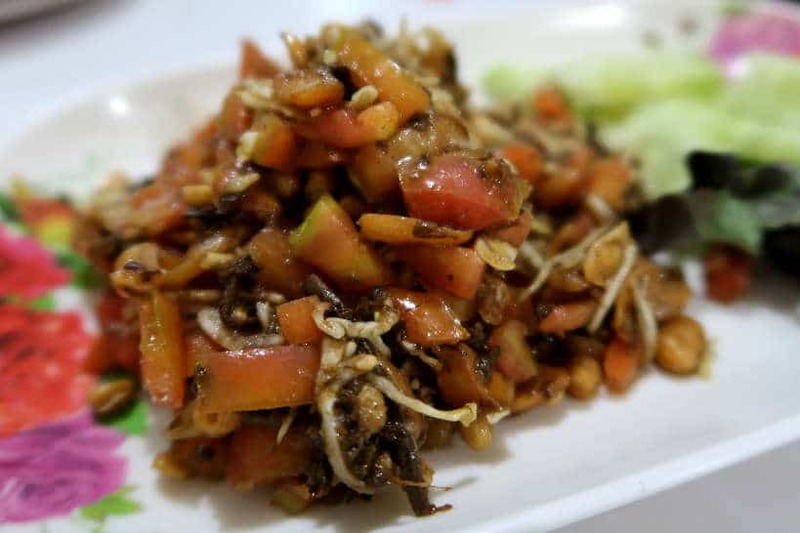 The fermented tea leaf salad or laphet thoke is one of the signature dishes from the Shan State. Laphet is the word for green tea and thoke means salad. The salad is full of crunchy textures and has pickled tea leaves, crisp, roasted peanuts and other crunchy beans, toasted sesame seeds and fried garlic. In Burma, Lahpet is very important to culture so much so that when tea leaves are harvested, the best of the crop is set aside for fermenting to make the salad, while the rest is dried and processed for drinking tea. One of the best restaurants in Chiang Mai to savor the earthly flavors of this salad is Burmese Restaurant & Library. This is a well-known restaurant for authentic Burmese dishes. They have a large choice of Burmese and Thai food alike. We recommend to stick with the Burmese food. Pro Tips: The plate sizes are rather small. We recommend trying several dishes and sharing them. Besides the tea leaf salad, our favorites are the stewed pork, eggplant curry and prawn curry. 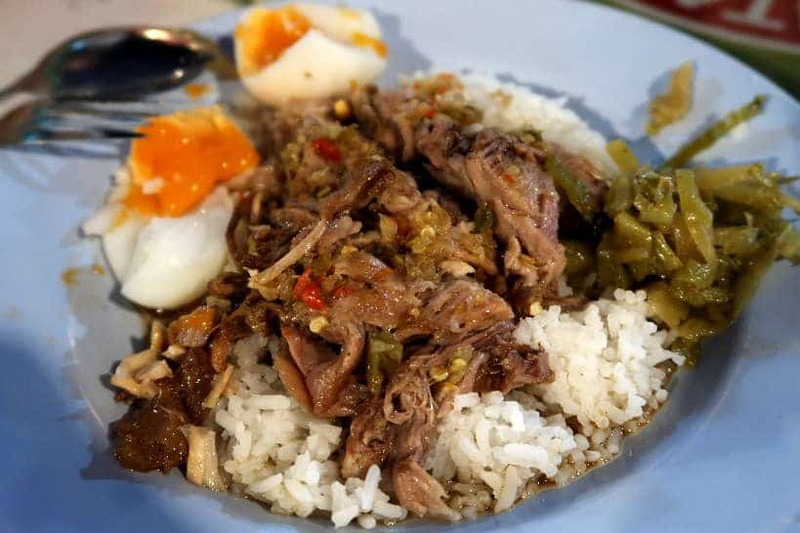 Although not a Lanna dish or northern Thai food, this Chiang Mai food guide would not be complete without the Cowgirl’s khao kha moo, stewed pork over rice. On any given evening, across from Chang Phueak Gate, the north gate in the old city, is the famous cowboy hat lady stall. Look for the stall with the longest line and lady with a grin on her face wearing a Stetson hat. 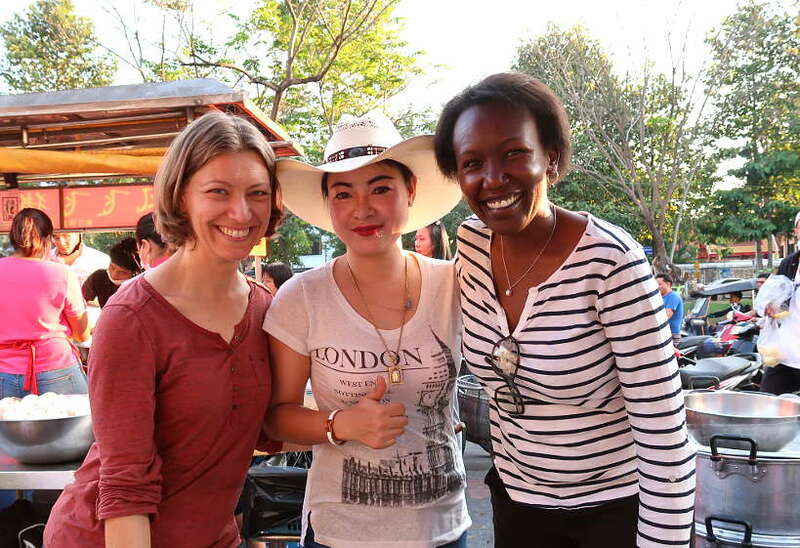 The Cowgirl’s khao kha moo is said to be the best pork leg and rice in Chiang Mai. It is a stewed pork leg that has been cooking for hours and served over rice. Accompanying it, is a boiled duck egg, garlic, pickled mustard greens and a Thai-chili sauce. What ends up on your plate is a simple, yet perfect dish. The pork is tender and seasoned just right. The bright orange duck egg is cooked perfectly and the condiments, especially the pickled mustard greens pack a punch of flavor. Address: Chang Phueak Market across the Chang Phueak Gate, Chiang Mai. Price: 30 Thai Baht – Approx. $0.95 USD for one plate served with a duck egg. Pro Tips: The Cowboy Lady has a newly opened physical restaurant where you can get the delicious khao kha moo earlier in the day. The hours are 8:00 am to 5:00 pm every day. 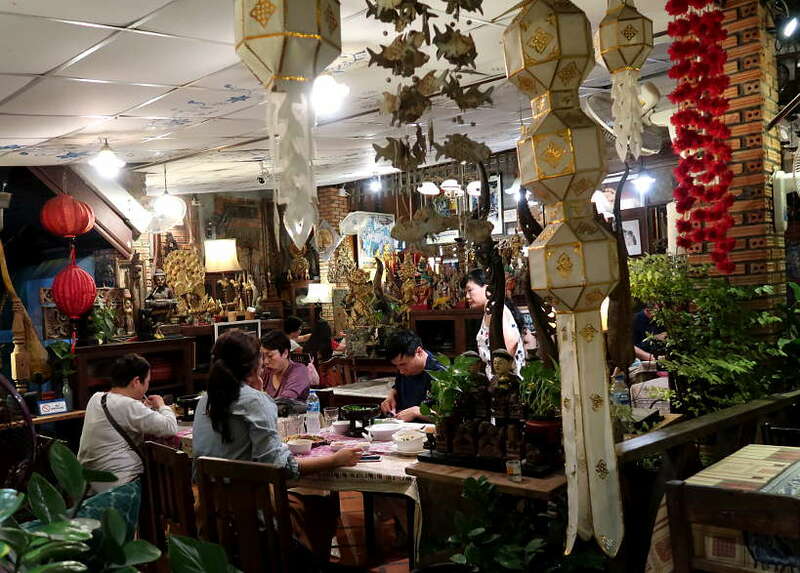 It is located on Mun Mueang Road at the intersection of Mun Mueang Road Soi 9 next to Hom Coffee. Another dish that is also not a northern Thai food, but a food in Chiang Mai not to miss is also at the Chang Phueak Gate or north gate market. 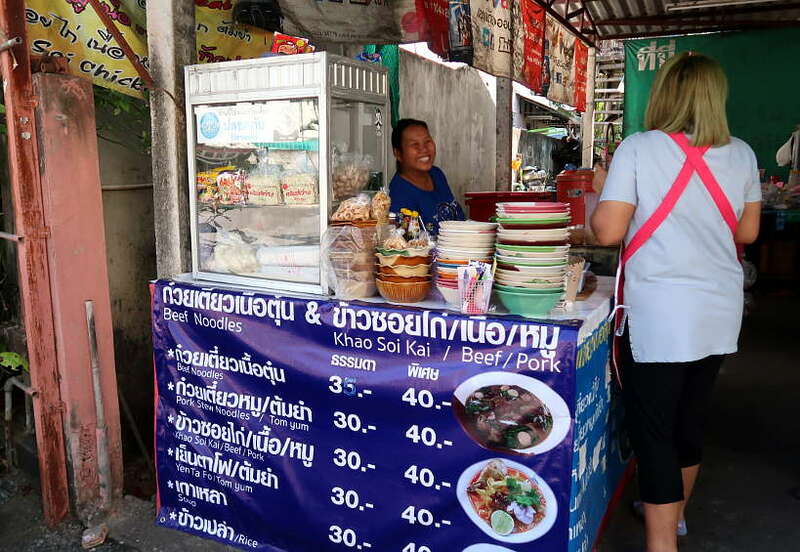 Located in the same cluster of food stalls as the cowboy hat lady, is Chang Phueak Suki, a food stall that sells suki, a common Chinese and Japanese dish. With a sizeable Chinese population in northern Thailand, this dish has been adapted with Thai variations, including the use of chili, lime, coriander and a spicy dipping sauce. At the stall, you’ll find two versions of this dish. You can have a dry version, called suki haeng, or a wet version with broth called suki nam. The suki consists of vegetables cooked with mung bean noodles and a mix of seafood or chicken or pork. The accompanying suki sauce is one of the best parts of the dish. It is a red tomato based sauce with sesame oil, spices and more. We tried both the wet and dry versions which were both very good. We preferred the dry version and with seafood, which we recommend. The fresh cabbage, vegetables, seafood combined with the suki sauce is divine. Pro Tips: One thing to be aware of is the small portion sizes. The dry version is particular disappears just after a few bites. You may consider starting with suki as an appetizer and then going to the cowboy hat lady for the pork and rice. Mango sticky rice or Khao niao mamuang is one of those traditional Thai desserts, you simply cannot miss. Very popular throughout Thailand, you’ll also find in other countries in Southeast Asia like Laos or Cambodia. This Thai dessert is made with glutinous rice, fresh mango, palm sugar and coconut milk. It is one of our favorite Thai desserts and one we wrote about in our article, 15 popular Thai desserts to indulge in. You’ll find many eateries, stalls and restaurants selling mango sticky rice. One of the best places to eat mango sticky rice in Chiang Mai is at Ton Payom Market. 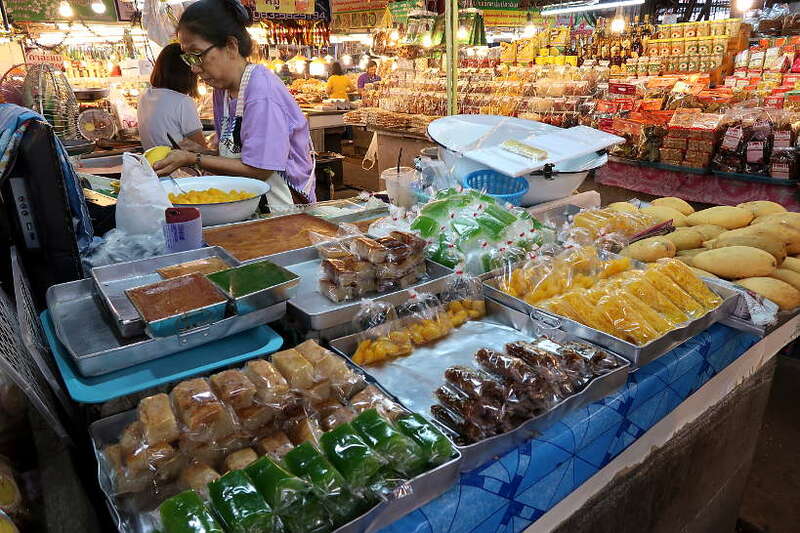 In the middle of the market is a vendor who specializes in Thai desserts, including freshly made mango sticky rice. We particularly like her extremely sweet mangoes that she cuts right in front of you. Her sticky rice is simply some of the best we’ve had. It is perfectly prepared with the right amount of coconut and sugar. 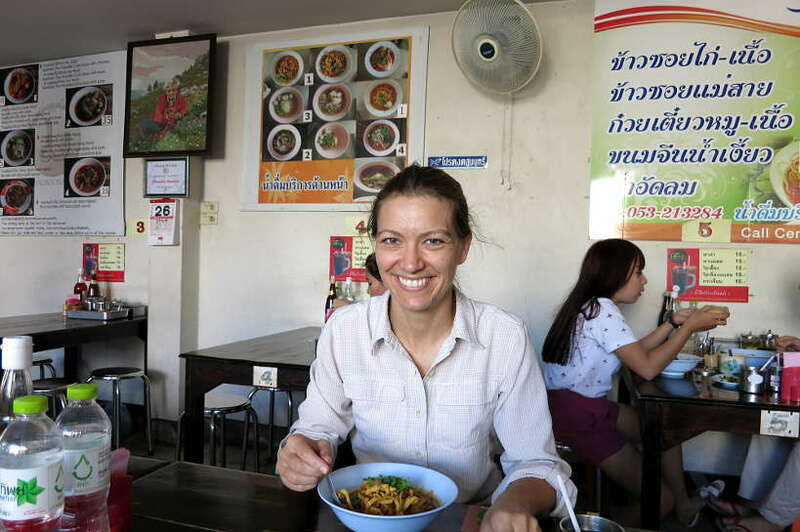 In our opinion, she makes the best mango sticky rice in Chiang Mai. You will be rewarded richly with a trip Ton Payom market for this dessert and more. Chiang Mai, also known as the “Rose of the North” is a foodie paradise with a unique culinary history and tradition. 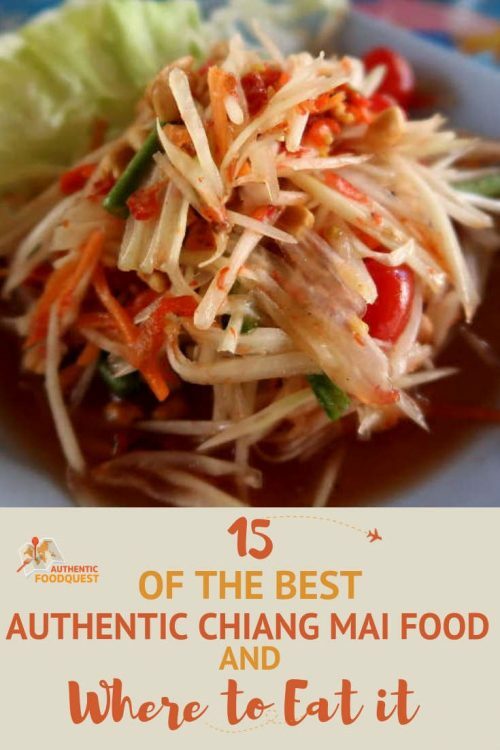 This list of 15 best authentic Chiang Mai food is an introduction to help you discover the range of authentic Thai food found in this part of the country. Now armed with this Chiang Mai food guide, you can count on tasty travels to the ancient capital of the Lanna Kingdom. 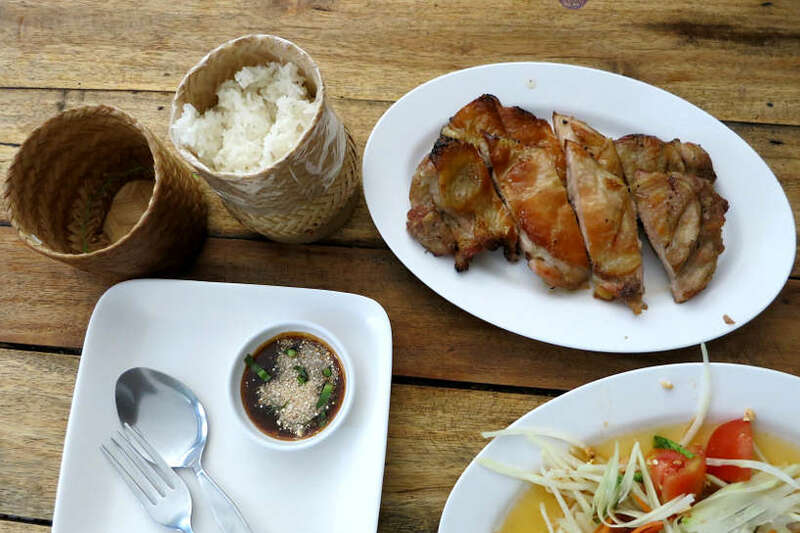 Travel deeper as you explore the flavors at some of the best local restaurants in Chiang Mai. Have you had Chiang Mai food before? Or, which one of these foods in Chiang Mai would you love to try? Tell us in the comments below. Indeed, Tracy, the food in Northern Thailand is unique and worth exploring. I will be honest and admit that I have never tried Chiang Mai food before, so this not only introduced me to good places to get it but also to the food itself. It looks and sounds absolutely amazing, so I may just have to make a point of changing that soon… Thanks for sharing! So glad you enjoyed the article, Britt. All these photos of this delicious food is making me hungry! I love Thai food and didn’t know that the northern Thai food is so different from the rest of Thailand. I’m dying to try one of those sour pork sausages! So glad you enjoyed discovering northern Thai cuisine, Lesley. The food is indeed different and worth discovering. Look for the sai oua sausages at your local Thai restaurant. They just might have them on the menu. Thanks for stopping by. Oh my god this food looks to die for, but I especially love the look of the Mango sticky rice! 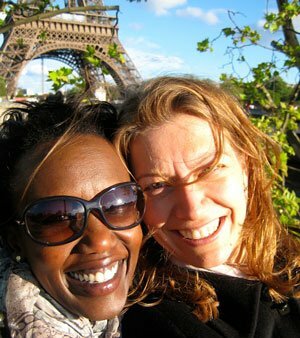 Well done on finding so much amazing food on your travels! 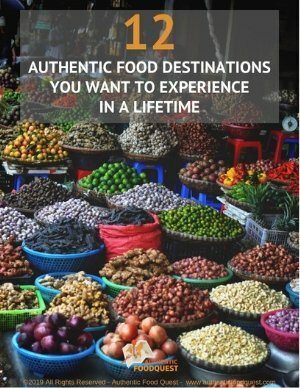 This guide about Chiang Mai’s food is so comprehensive! You guys really showcased the best food and culture of Thailand. #13: Pork Legs And Rice – Khae Kha Moo looks so ridiculously delicious!! I wish I could mimic some of these recipes at home. 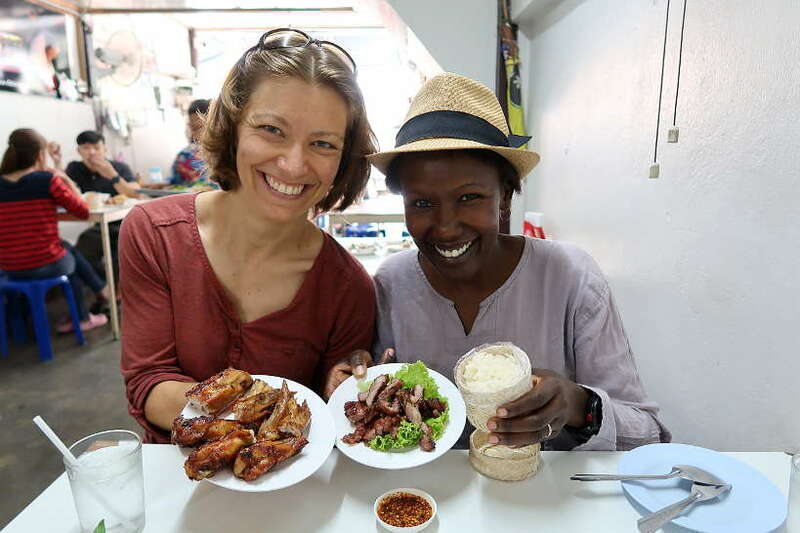 So glad you enjoyed our comprehensive Chiang Mai food guide. 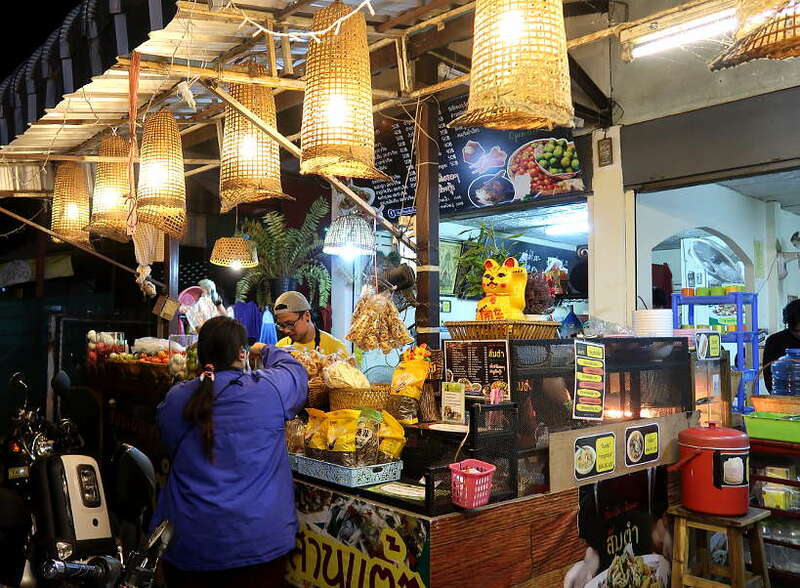 The idea is to make finding the local food easier for travelers to Chiang Mai or the region. Thanks for stopping by. YUM!!!! Now i’m just really hungry. Saving this so I can hit up all the best places + try all the authentic northern thai food this November. Those coiled sausages look the tastiest to me. Perfect. So glad this food guide will come in handy soon. Definitively seek out the sai oua sausages. They are amazing. Feel free to reach out if you need any local food tips! It has been a minute since I read such a detailed post! The food culture in Northern Thailand is evidently very vibrant! I like the clear distinction and the undeniable feeling of booking the next flight to Chiang Mai to eat from the famous lady! Thanks, Bonnita. Really appreciate the feedback. Indeed, the food in Chiang Mai is worth flying over for 🙂 Hope you get there soon. What an amazing post! You ladies managed to find so many delicious-sounding dishes. I have only heard of a couple of these, so I feel like I really need to visit Chaing Mai! Those sai oua sausages, the mango rice, the tea leaf salad, the mushrooms, I want to try it aaaaaall! p.s. I should not have clicked on this link before my lunchtime. You have made me so hungry, and I don’t know anywhere nearby where I can buy this kind of food! doh! Great Josy. So glad you enjoyed our comprehensive Chiang Mai food guide. 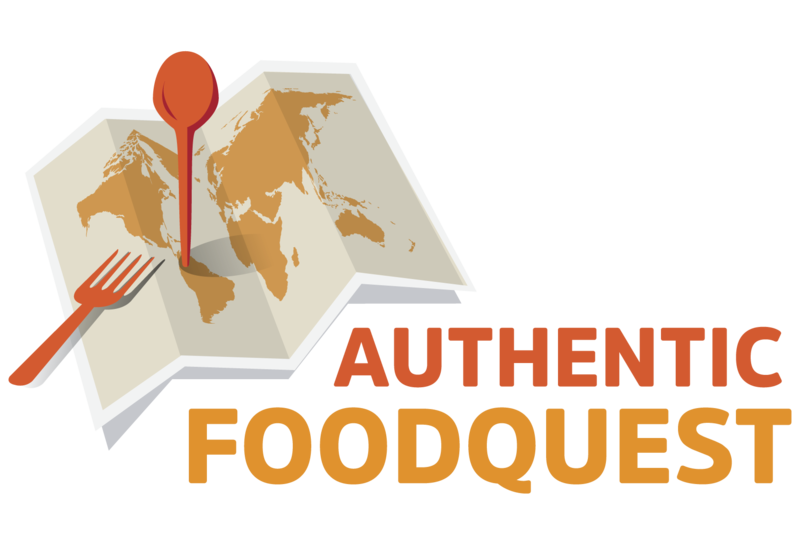 We had an amazing time discovering the local specialties and now, with this food guide, we want others to do the same. Hope your travels take you to Chiang Mai soon. Your post is making me hungry, as always (and I actually just had Thai food for lunch – green curry chicken with brown rice!). I would’ve loved to add green papaya salad to my meal and finish it off with mango sticky rice. Although I’ve never had young jackfruit salad, so I will have to give it a try next time I’m in Thailand. Unfortunately I didn’t make it to Northern Thailand last time I was there but this post will be the perfect guide for me when I do! Perfect timing. A Thai lunch while reading this northern Thai food guide. A trip to Chiang Mai is certainly worth it if you traveling to Thailand. Thanks, Krista. I had no idea how different food in Chiang Mai and Northern Thailand is from the rest of the country! And I really want to try that mango sticky rice dessert. Influenced by the region and as the former Lanna Kingdom, the food in northern Thailand developed its own identity. 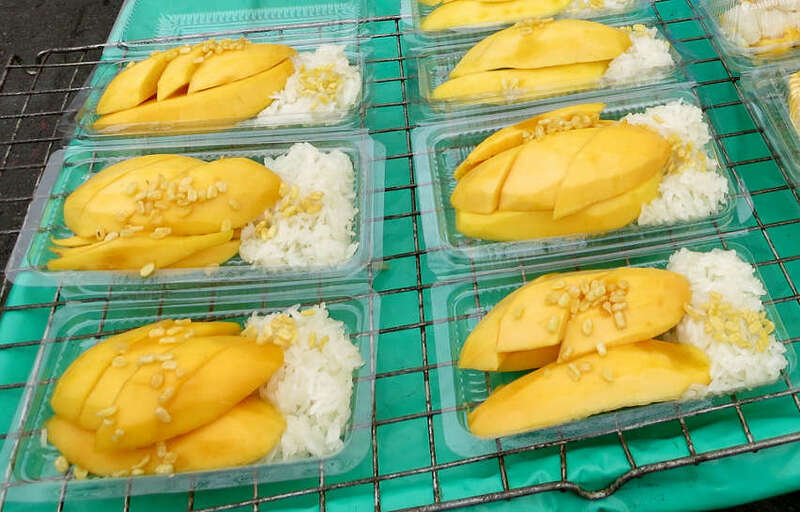 Fortunately, you can find mango sticky rice everywhere in Thailand. Your local Thai restaurant might it on the menu. Thanks, Kristin. I am a massive foodie and of all the places I have travelled to, I have to admit that Thai food is my absolute favourite. I live in Athens, Greece now and it’s not so easy to find it. We have one place here and it’s super expensive but I am forever dragging my friends along and I think the owner thinks I have some serious Green curry addiction problem because I am always there and I always order the same thing, LOL. So many great recommendations here I haven’t tried that I will have to keep in mind when I’m in Chaing Mai. The Gaeng Hang Lay Moo, in particular, looks amazing. Love how well you capture the food and the markets in your photos! 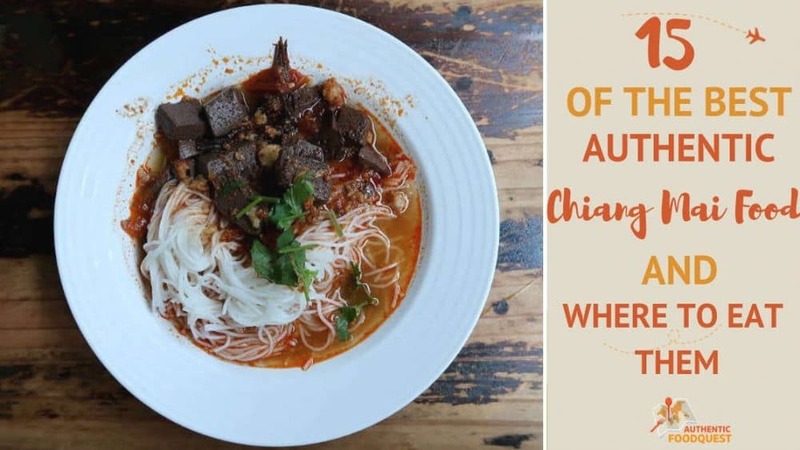 Perfect, Melissa, when you do make it to Chiang Mai use this food guide to help you discover the best of Chiang Mai food. So glad you are a Thai food fan as well. Thanks for stopping by. The young jack fruit dish is like one we have in the Philippines. The sukiyaki doesn’t look anything like the Japanese dish of the same dish! But there’s a lot that’s great to try! The Thai sukiyaki has evolved over time and is now uniquely Thai. So different, but the same name 🙂 I wonder if the young jackfruit salad tastes the same as in the Philippines? Thanks, Carol. What a mouth-watering post! I love the sound of Khao Soi – especially the coconut and chicken combination. I’m a big fan of Larb, but haven’t had the pork style, and the Chiang Mai version sounds rich and delicious. From your response Hannah, you would love the food in Chiang Mai. Hope you get there soon to try the northern versions of larb and more. Thanks for stopping by. It sounds like there are a whole lot of things to try in Chiang Mai. So neat that you went for a month and stayed for two years. That’s falling in love with a place for sure. Are most of the foods spicy? It sounds like it from your descriptions. I had a Thai nanny when I was a child and she made us the most wonderful foods, but I don’t remember spicy ones. She may have been from a different area. It was fun to see these foods. Love those great big pans. So glad you enjoyed the article, Kathleen. The spice level in the food depends on the dish and cook. You can absolutely tailor it for your needs. Hope you get a chance to visit Chiang Mai at one point. Amazing city. Thanks for stopping by. Great to hear….lol, that’s the idea, to tempt you into exploring the local specialties. Glad you enjoyed the article. Oh, my goodness, your posts always make me so hungry! This is an excellent food guide for Chiang Mai, which will come in very handy when I go to Thailand in fall. I absolutely adore Thai food and we have some excellent Thai restaurants here, in Los Angeles. However, I’m sure they don’t compare with the real experience I’ll have in Chiang Mai. Those sausages look so flavorful and succulent! I can almost feel the taste in my mouth. Perfect timing, Anda. 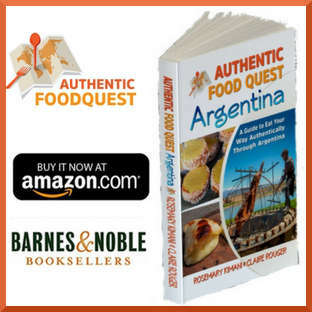 Happy to help guide you to the best local dishes. You will have a wonderful time. Feel free to reach out for any food tips prior to your trip. Cheers. Khao Soy is my favourite Thai dish and what an amazing experience would it be to have it from the street vendor in Chiang Mai. The best thing I love about Thailand is actually their food! I haven’t been to Chiang Mai yet though I’ve been to other parts of Thailand and I cannot wait to get there. You’ve made a wonderful guide here for foodies like me, thanks! You are right, Thailand just captivates your taste buds in an indescribable way. Hope your next Thai travels take you to Chiang Mai! Thanks, Medha. I’m not big on rice, so it’s always the noodle dishes that I head towards when it comes to Thai cuisine. I do love mango, though, so I usually get the mango sticky rice and just don’t eat the rice. The papaya salad is always a favorite of mine. And I had some of the best chicken in Thailand, too. The skewered chicken on the barbecue looks so delicious from your photos! That’s the good thing about Thailand is that you can choose between rice and noodle dishes. Papaya salad is one of our favorites as well. So much good food to choose from. Thanks,Jennifer.